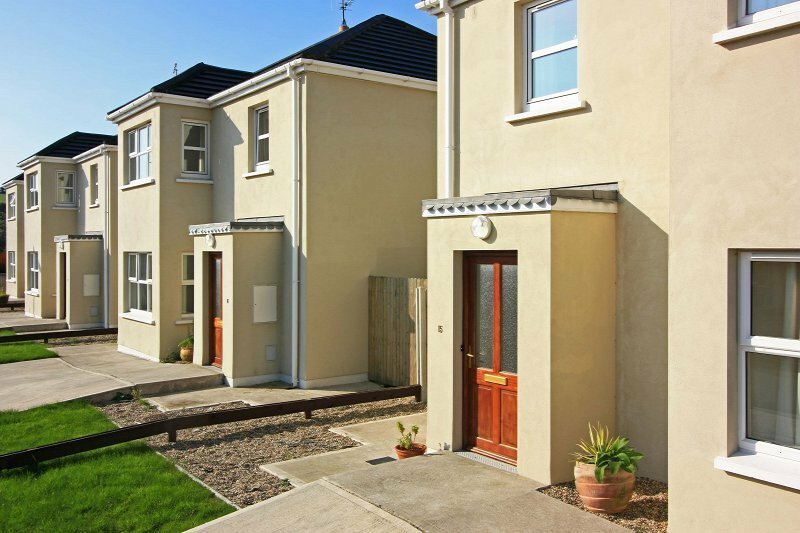 The Moorings is a small cul de sac of holiday homes within a short stroll of SKibbereen town. A great location for exploring all the wonderful places and activities that West Cork has to offer. The Moorings is a small and exclusive holiday homes development in a delightful location on the Glencurragh Road in Skibbereen, West Cork. It takes just 5 minutes to walk from The Moorings into Skibbereen Town. There is one four bedroom house that can accommodate up to 7 people and is wheelchair friendly. Downstairs is a twin bedroom with ensuite with a wheel in shower and grab rails. Upstairs are three other bedrooms (1 x double bedroom, 1 x twin bedroom and 1 x single bedroom). Pets are welcome on request and we have two dog boxes available for use during your stay. We would kindly request that pets be kept downstairs and away from the bedrooms and that they sleep outside. An additional charge of €25 euro per pet per stay will apply, this is payable onsite to the caretaker. The Moorings are situated right on the edge of town, with restaurants, shops and nightlife all on hand, yet still only a short drive from the beach. Indeed, being within an easy walk of the town’s many friendly and lively pubs means no problems with having a sociable drink in the evening; a plus factor that makes for the most relaxed of stays. For most holidaymakers, this convenience is a considerable recommendation when choosing where to stay. Whether it’s couples seeking a romantic break, energetic hiking groups yearning to stretch their legs, families with young children that can’t wait to get going with a bucket and spade on golden sands, or devotees attending one of the hugely popular festivals held throughout the year, everyone loves coming to this part of West Cork. Visitors from abroad are especially taken with the combination of friendly welcoming atmosphere and stunning scenery, and having once experienced it come back again and again. In fact the number of famous names with a bolthole here would surprise you. You could well bump into actor Jeremy Irons and wife Sinead Cusack, who restored nearby Kilcoe Castle, for example, while doing your weekend shopping at the Farmers Market. Tragumna is a sandy, sheltered beach, situated about four miles from Skibbereen. It can be reached by turning off the R596 at Abisdealy bridge and following the signs for Tragumna. Public car parking, toilet facilities and lifebuoys are provided at the beach. Life guards are on duty during the bathing season. Roscarbery is approx 12 miles from Skibbereen. Owenahincha is a sandy beach that backs onto sand dunes. The main route to approach the beach is from Clonakilty on the N71. Turn off at Burgatia Cross onto the R598, which leads down to the beach. Public car parking and public toilet facilities are provided at the beach. Life guards are on duty during the bathing season. There is a short, pleasant cliff walk between the Warren Strand and Owenahincha. The Warren is a sandy beach located at the mouth of Roscarbery Bay and accessed by turning off the N71 at Warren Cross. There is a pitch and putt club adjacent to the beach. Public car parking, toilet facilities and lifebuoys are provided at the beach. Life guards are on duty during the bathing season. Skibbereen is a charming and bustling market town which offers a wide range of services, facilities and goods. It is peppered with lots of great pubs and restaurants. Beauty spots like Mizen Head, Crookhaven, Dunmanus Bay, Glandore, the splendid beaches of Inchydoney and Castlefreke, golf course, pony trekking, fishing, boating, and so many more attractions, are within an easy drive. Skibbereen doesn’t close down during the winter months, but continues its bustling cheerful way throughout the year. Whenever you come, there is always something going on - another plus factor for those seeking the ideal holiday location. *Fishing - From hiring your own boat to deep sea fishing trips the choices are many and varied. *Walks - There is an abundance of walks in the area, some well known and others almost undiscovered! *Explore West Cork - From Skibbereen to the Beara Penninsula, Sheeps Head and the numerous local villages, you will have a full programme. Spend a day on the islands, Cape Clear where Irish is spoken, Sherkin Island with its beautiful sandy beaches. All within a few miles of Skibbereen. Take a sharp left and you will see the Reception centre on your left.